Providing you with the best Interior and Exterior Painting Dubai. So we are the leading vendor for the Interior and Exterior Paintings with the best experience in providing the best quality painting services to your home, villa, apartment, office. In short, we are providing our services to both commercial and residential areas for those customers who need our services. We have made everyone happy with our services from a small house owner to a big apartment, from a businessman to a shopkeeper. We have a professional team of a painter who is much qualified and experienced enough to understand the technology works and take a job and complete it in the best results. The painters we have no doubt are the best in Dubai with their record service. Samraa Maintenance services have a team of inspirational painters who provides the paintings services and decorating, have the knowledge and experience to understand your painting and decorating requirements. We paint just like you say us to paint, and sometimes we give you the suggestions for it is required there and help you to redecorate your house. Our professionals possess the ability of the establishment to a more than professional standard. Our painters provide the amazing painting, remodeling services at highly opposing rates and furthermore we offer you a free quotation service for all of the customers who need our Interior and Exterior services all over in Dubai. At Samraa Maintenance Services we have the experts Interior and Exterior Painting Dubai. Like, a fresh coat of the interior paint still remains the easiest and most affordable way to increase the value of your home and to give you the best home update. Our professional interior painters are the best in business. They only pay their attention to details and leave no mess behind and while working they give you the peace of mind which gives you the satisfaction. So if you are looking for the interior painting at your place and want some updates at your place then you probably call us. Because the remodeling of your home is not the option. The new coat of interior paint will be the best option and also the solution. 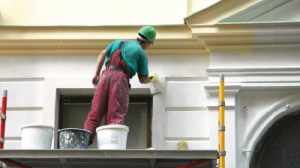 Our painters have years of experience in exterior painting field. It is the best way to renovate a home professionally but we have observed that people do this very late. Because they are not that conscious about that. Preparing the service in the Exterior painting is the real trick. That means to remove all the debris from the Exterior of a home that possibly could prevent that paint from sticking. We will provide a service that will make sure that the paint of your house will look good and perfect.